The designer behind Lorde's 2017 Coachella set has denied the singer's claim Kanye West copied the design, saying it was "not in any way new". Lorde posted a series of pointed stories to her Instagram on Monday of West performing in an elevated, rectangular tank at a festival in Los Angeles over the weekend. "I'm proud of the work I do and it's flattering when other artists feel inspired by it, to the extent that they choose to try it on themselves," Lorde says in print over her final photo of her own Coachella set. But don't steal, not from women or anyone else, not in 2018 or ever. 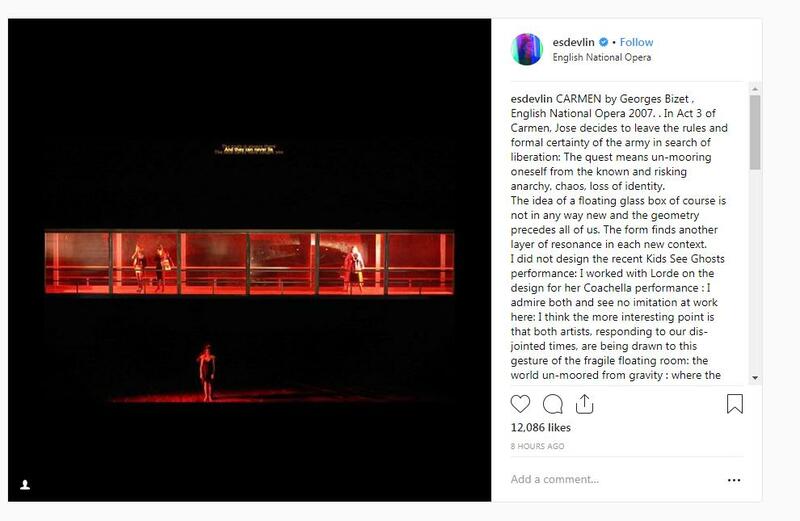 Now the designer behind the 'Royals' hitmaker's set has weighed in, posting a series of images of the set of the 2007 performance of Gorges Bizet's Carmen by the English National Opera. 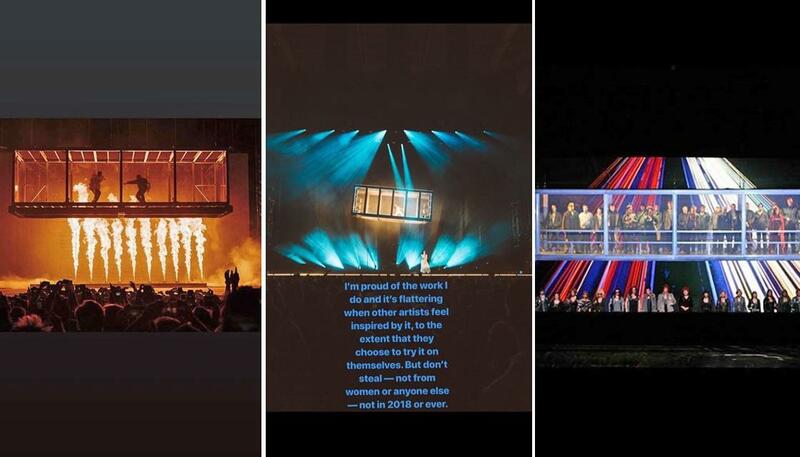 In the photos, the cast perform the French composer's work from inside hanging glass boxes, illuminated with different colours - much like both Lorde and West's sets. "The idea of a floating glass box of course is not in any way new and the geometry precedes all of us. The form finds another layer of resonance in each new context," stage designer Es Devlin captioned the first image. "I did not design the recent Kids See Ghosts performance: I worked with Lorde on the design for her Coachella performance: I admire both and see no imitation at work here." Devlin was the stage designer for both that 2007 performance, and Lorde's Coachella set. While Devlin did not design West most recent performance with Kid Cudi, according to The Guardian she worked with West on the Touch the Sky, Glow in the Dark, Watch the Throne and Yeezus tours. In an interview with The Spinoff in April 2017, Lorde talked about wanting to create "something we hadn't seen" with Devlin. "It's hard to come up with stuff that feels new, and with the tank it felt weird and interesting and quite specific to me," Lorde told The Spinoff. Devlin is a female designer, interesting to note as Lorde's caption accused West of stealing "from women". The accusation from Lorde came as surprising to many of her fans, given she and West have worked collaboratively in the past, and she previously referred to the rapper as "my hero". During the US jaunt of her recent Melodrama tour, Lorde played homage to West while performing in his hometown of Chicago. She performed an acapalla version of his song 'Love Lockdown', and a piano-assisted 'Runaway'.